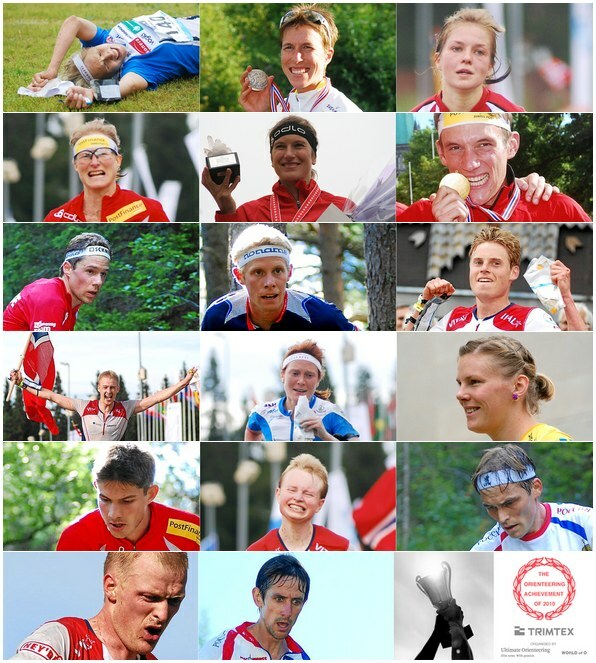 Olav Lundanes and Simone Niggli have been awarded with “The Orienteering Achievement of 2010″ titles in the mens and womens class, respectively! 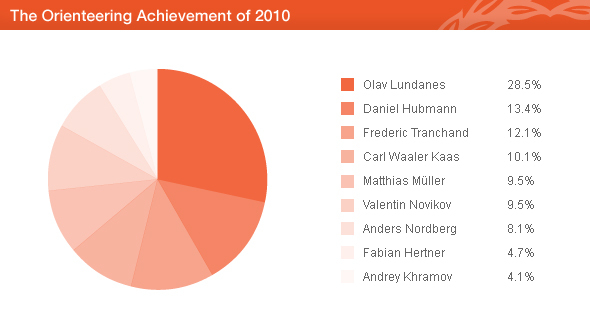 Among the men Olav Lundanes got an impressive 28.5% of the votes – more than twice as many as Daniel Hubmann – last years winner – in second spot. 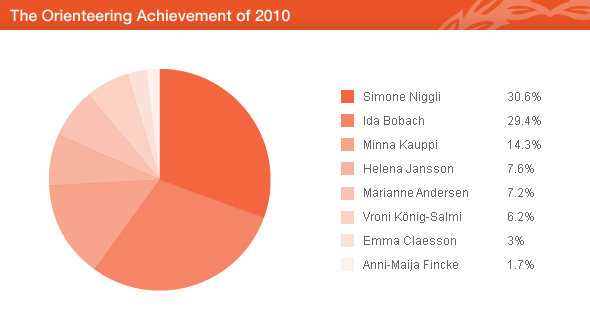 Among the women, Simone Niggli won ahead of Ida Bobach for the second year in a row – but this year with a very small margin of less than 20 votes! The vote has been decided by the big international readership of World of O and Ultimate Orienteering – nearly 3000 unique votes from more than 50 different countries have been delivered – making these results very representative for the worldwide orienteering community. 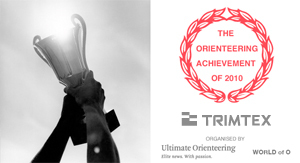 Thanks go to all voters and Trimtex, OOCup, Portugal O-meeting, Kopaonik Open and Fjord-o Arctic Midnattsolgaloppen for sponsoring “The Orienteering Achievement of 2010″. In the Men’s class Olav Lundanes won with 28.5% of the votes ahead of Daniel Hubmann with 13.4%, Frederic Tranchand with 12.1% and Carl Waaler Kaas with 10.1%. In the Womens’s class Simone Niggli won with 30.6% of the votes ahead of Ida Bobach with 29.4%, Minna Kauppi with 14.3% and Helena Jansson with 7.6%. Q: Congratulations on being awarded “The Orienteering Achievement of 2010″! Thanks a lot! It is a big honor to win “The Orienteering Achievement 2010″! Q: The orienteering community really appreciated your achievements in 2010 – giving you more than twice the amount of votes as number two. Are you still thinking about your victories in 2010 every week, or are your thoughts already in France? For me it would have been good to just focus on France, but all the time there is somebody reminding me about Trondheim in some ways:) But most of the time i can focus on France, and my preparations so far have been good. Q: Can you name three key moments in your preparations for WOC long distance (which I guess started a long time before) which you think where decisive for you winning the title? 1. I have been running very many hours in relevant terrain since I was a child. A wild guess may be 500-700 hours over the last 15 years. 2. Good mental preparations. Knowing that I was good enough to be in the top, after some good long distance races the last year ahead of WOC. 3. Knowing the old map very well – and also what to expect where. Q: For the second year in a row the two winners of WOC long distance win “The Orienteering Achievement of the Year” – and most of the top courses in “The Course of the Year 2010″ were long distance courses. At the same time there are fewer and fewer long distance races on the international elite calendar. What is your comment to that? Are the real long distance orienteers like you a dying race? I think that all orienteerers like a good and challenging long distance. Of course we have to make some compromises if we want to be on TV, but I think we have gone to far. Jukola, on the other hand, both managed to be the “Course of the Year”, and to have what I think was the biggest amount of TV-controls. So I think it can be better in the future. For me the long distance is the ultimate challenge, because it requires hard preparations for a long time, and because it is really hard to be on top both physically, o-technically and mentally for 90 minutes. I hope that we in the future can have more real long distance races in the World Cup, or at least keep it at the World Championships. Next year we have just one important long distance race in Norway, so I have to prepare for WOC long distance in other countries. It is tough for me to see that Norway is fronting the work on trying to remove the long distance. It is hard to say if the real long distance orienteers are dying, but when I look around on training maps in the Internet, it is clear that orienteers love challenges. Those who like to run together and have a sprint finish, choose running instead. Q: What is your best tip to juniors out there who want to get up towards your level? My best advice for juniors and young runners is to run a lot of orienteering in different terrain. One usually says that there are no shortcuts in elite sports, but maybe that is the one in orienteering…. Q: Any final words to your fans out there – there seem to be many! I want to thank everybody who voted for me. It is great for me that others appreciate what I am doing. Enjoy the training and the winter! Q: Congratulations on being awarded “The Orienteering Achievement of 2010″! This is the third time you win the Orienteering Achievement of the year. However, it has never before been as close as this year – less than 20 votes ahead of Ida Bobach. Is this a sign of it going to get harder to win in the orienteering course the next years as well? I think it’s always very tough to win such a prize because there are so many good athletes around the world who train very hard to be on the top. Therefore I am very honored to get the prize. I’m very impressed of Ida’s performance this year and I’m sure that she will be one of the top names in the future. Besides I am very proud that we are two girls of Ulricehamns OK on the top! Q: Can you name three key moments in your preparations for WOC in Norway which you think where decisive for you winning there? I remember my first preparation camp in Trondheim in autumn 2009. I quickly realised that it would be a big challenge for me, and I really liked the terrain and felt comfortable soon. The second key was for sure my good training during the winter and spring, which made me strong for the marshes. The last motivation kick I got was during the norwegian test races in Levanger where I performed very well in a top starting field. There I saw definitively that I can win in this kind of terrain. Q: 2010 has been your most dominant season since 2005 – with only one World Cup race outside top 2. What did you do to regain your stability this year? Is it all about the mental aspect, or have you improved physically and orienteering technically as well? I think I have improved further in all the aspects and I had big self confidence this year. I really felt during the races that there was no big risk for bigger mistakes and that made me strong. Q: How are your preparations for 2011 doing? Is your technical orienteering at such a level that you believe that a “normal race” can give you a victory in a technical French middle distance race? I started well in the winter training. We have a new training concept: there are two training centers (Bern and Zürich) where we get a lot of high quality trainings. I join for the intervall session and two orienteering-trainings each week. It’s a big motivation for me, and I think I can improve a lot. Concerning the French terrain, I think that I have shown at the WC race in Annency that I can handle the terrain! It’s very important to increase the training volume stepwise and I also think it’s smart to train alternatively when you are a junior. And last but not least: enjoy the sport! Thank you very very much for your vote and your support during my whole career! See you out there in our beautiful sport stadium- the forest! The nominated runners – and details about why they were nominated – can be read here. Winners of prizes for lucky voters and sponsored links were published on Tuesday. The winners are repeated below including a presentation of the sponsors for your convenience. 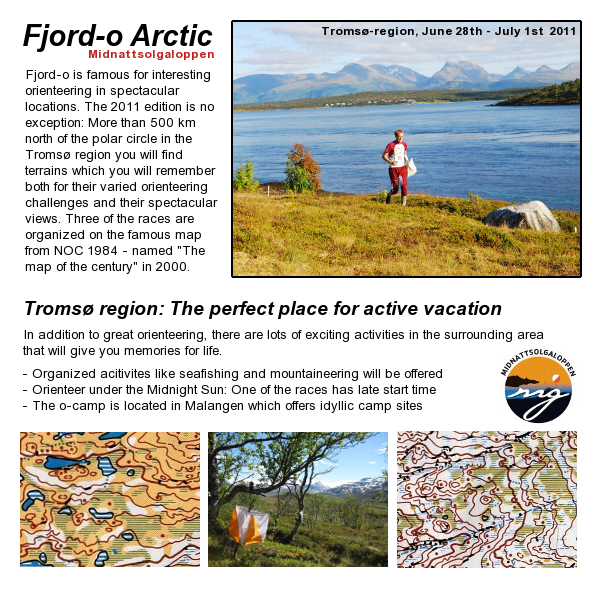 We would like to thank Trimtex, OOCup, Portugal O-meeting, Kopaonik Open and Fjord-o Arctic Midnattsolgaloppen for sponsoring “The Orienteering Achievement of 2010″. Thanks to them World of O and Ultimate Orienteering were able to draw lucky prize winners among those who nominated and voted in this years election. Stefanini – a transferable packet for the complete Kopaonik Open 2011 will be drawn. The packet contains “Training, model event and 6 events Kopaonik Open, accommondation in apartments in Hotels in Turistic Center (from Monday 11.07 to Monday 18.07), provided guides for excursions and hiking tours, T-Shirt of competition”. Håvard Irgens – a transferable packet for the complete Kopaonik Open 2011. The packet contains “Training, model event and 6 events Kopaonik Open, accommondation in apartments in Hotels in Turistic Center (from Monday 11.07 to Monday 18.07), provided guides for excursions and hiking tours, T-Shirt of competition”. Congratulations to all prize winners! The prize winners will be contacted by e-mail later today. Thanks to all websites that linked to “The Orienteering Achievement of 2010″ organized by World of O and Ultimate Orienteering, we were able to make the election results as representative for the orienteering community as possible. The winners of sponsored links are asked to send an email to niels-peter [at] ultimate-orienteering.com to ask for further details. Note that the sponsored ads must be for orienteering related content! Trimtex Sport, based in Norway, is one of the main producers of orienteering sportswear. Since its foundation in 1976 with base in the orienteering market, Trimtex Sport has been producing sportswear with focus on unique colours and designs, for clubs and corporations. Today, Trimtex Sport is the proud maker of outstanding sportswear, which is carefully designed from top to bottom to fit the customer’s needs and specifications. Fjord-o Arctic Midnattsolgaloppen is the biggest and most popular event which is regularly organized north of the polar circle. Fjord-o is known for its mix of interesting orienteering with wonderful nature between fjords and mountains. Fjord-o 2011 is organized from June 28th until July 1st 2011. Among the Lucky voters, 2 transferable starts for the complete Fjord-o Arctic – Midnattsolgaloppen 2011 will be drawn. Kopaonik Open is held since 2001 on beautiful terrains in the national and tourist centre Kopaonik in Serbia. Kopaonik is the biggest mountain of central Serbia, spreading its wide mountain-ridge 83km long. Kopaonik is also called “Mountain of the Sun” – with almost 200 sunny days annually. 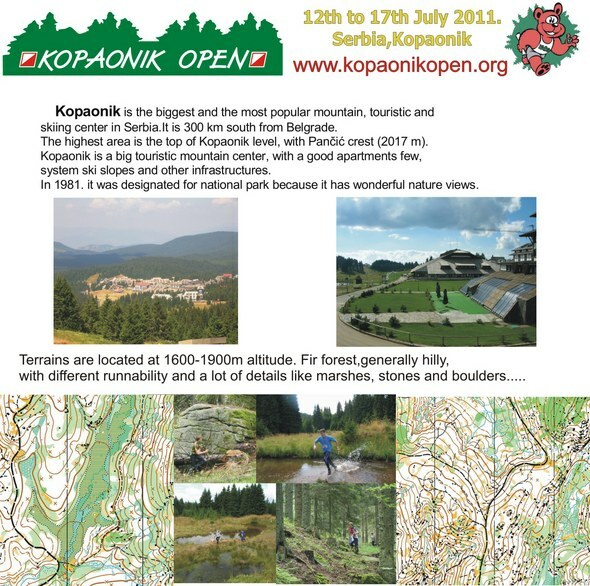 Kopaonik Open 2011 is organized in Kopaonik from July 12th until July 17th 2011. Among the Lucky voters, 2 transferable packets for the complete Kopaonik Open 2011 will be drawn. The packet contains “Training, model event and 6 events Kopaonik Open, accommondation in apartments in Hotels in Turistic Center (from Monday 11.07 to Manday 18.07), provided guides for excursions and hiking tours, T-Shirt of competition”. OOCup is a popular Slovenian event which is famous for its interesting karst orienteering and great nature. OOCup 2011 is organized from July 22th until July 26th. Among the Lucky voters, 2 transferable starts for the complete OOCup 2011 will be drawn. For the second time in its history, Grupo Desportivo dos Quatro Caminhos organizes Portugal “O” Meeting. The Portugal “O” Meeting is a foot orienteering event, counting for IOF’s World Ranking (IOF WRE) and for the Portuguese Orienteering Federation’s Cup, open to people of any age, that may participate in the competition or open classes, individually, or in a group. 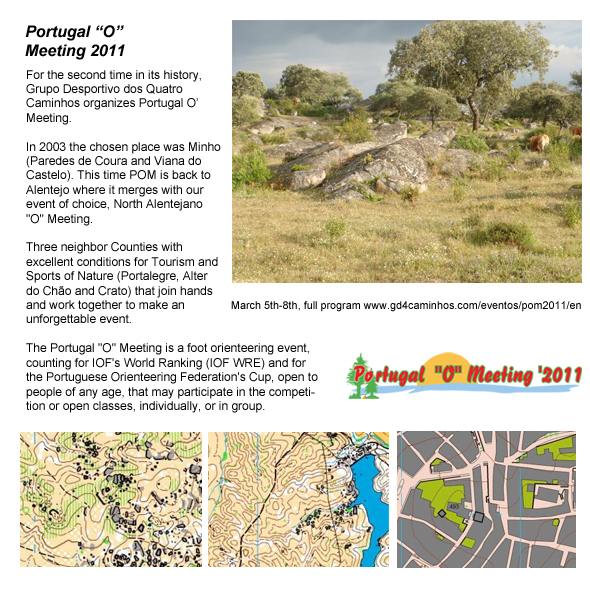 Portugal “O” Meeting 2011 is organized in the surroundings of Portalegre from March 5th until March 8th 2011. Among the Lucky voters, one free transferable start for the Portugal “O” Meeting will be drawn. 14 Prizes for Lucky Voters: Check if you won! Last day to vote for The Achievement of 2010! Vote for The Achievement of 2010 now! Win Starts in Popular Events and Trimtex prizes!